Arm-Tex carries a broad line of sampling thieves and sampling "bombs". Sampling thieves are heavy duty brass, come in 3 different sizes, and available with cords, chains, or gauge tape for safe and efficient use. 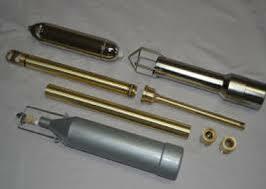 For more information about our petroleum sample thieves and bombs, contact Arm-Tex today!